Well, the first step to do is to remove the crank. Follow the instruction stated in the manual. The photo on the left shown the MRP LRP chain guide after the crank was removed. The chain guide was very muddy because I just had a muddy ride that morning. Make use of the opportunity to clean and lub the BB. 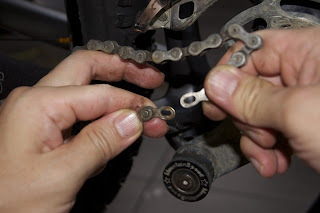 Next, disconnect the chain so that you can separate it from the front derailleur. 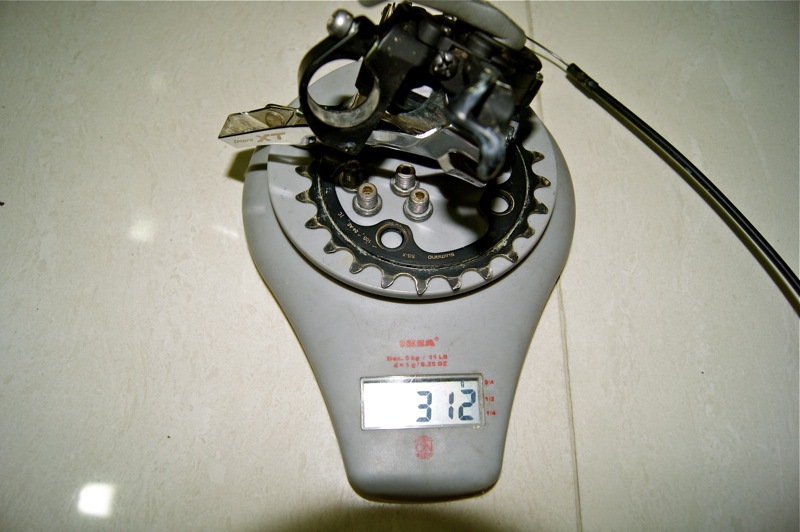 As my dual rings made up of 32/24T, the obvious choice is to remove the granny (24T). 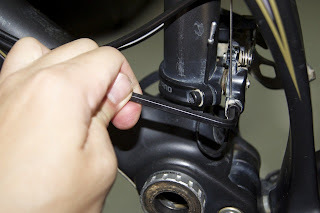 Use the proper tool to remove the four bolts that secured the granny onto the crank. 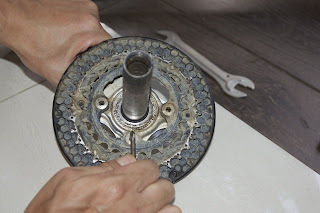 You have the option to screw the 4 bolts back onto the crank, but I preferred not to in order to save weight. Just remember to clean the 4 holes after trail ride. To remove the front derailleur, unscrew the allen bolt that secured the shift cable, and the bolt that secured the derailleur onto the frame. 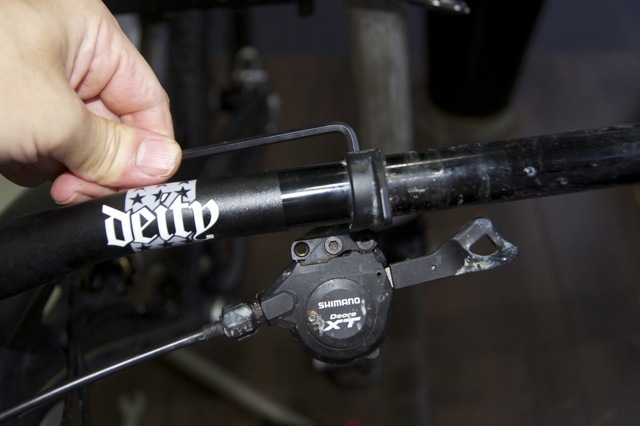 Gently pull the shift cable away from the frame and remove the front derailleur. Remove the shifter is easy. Just unscrew the bolt with allen key and remove the shifter from the handle bar. 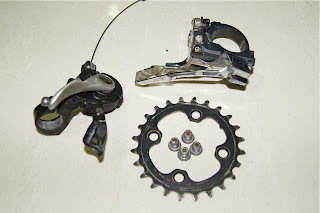 All you need to do is to remove the 3 components: (a) shifter, (b) front derailleur and (c) granny ring. I shed about 310grams from my Nomad carbon. Assemble the crank and chain back onto the frame. 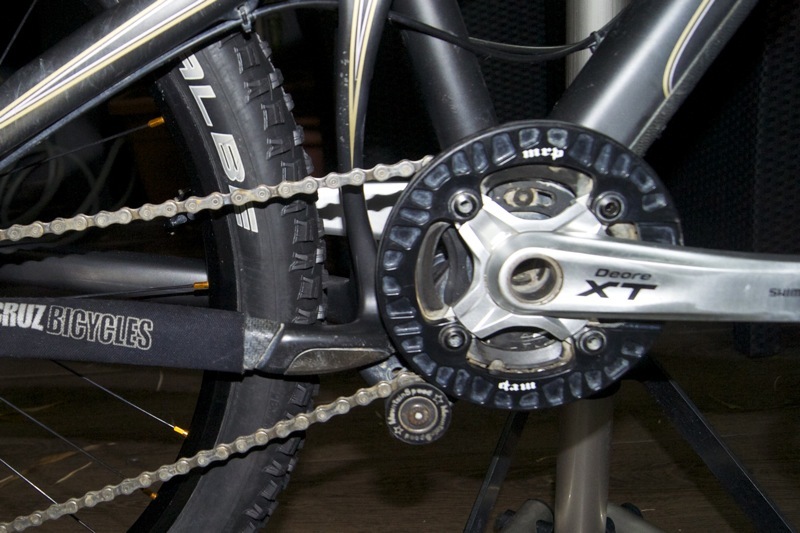 Here it go, the 2x10 drivetrain was converted into 1x10 in less than an hour. 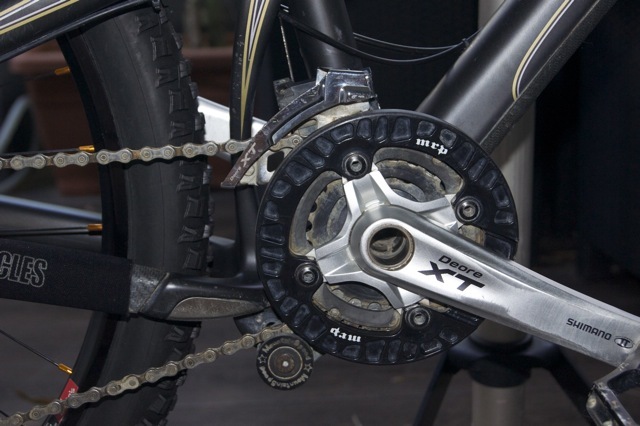 Moving forward, if the 1x10 setup suit my ride, I will replace two components: (1) XTR long cage rear derailleur with SAINT short cage rear derailleur, and (2) MRP LRP (dual ring chainguide) with single ring chain guide. The new 1x10 setup failed the first test ride. Did a few hop and the chain dropped inward. The test result proved that the dual chain guide will not work on single ring. 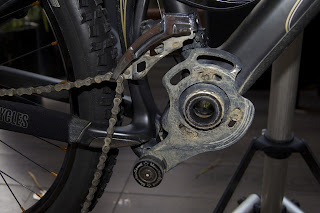 Sigh...need to get a single chain guide soonest. hi bro, jus wondering is ur xt 785series? and u can fit 32/24 smoothly? Yes bro, my XT is 785 series. It could fit 32/24 smoothly. i see cos currently mine is 40/28.. honestly my legs arent that strong! haha! thinking of changin to 36/22 or d same as ur setup.. what do u tink? I have since changed to 38/26, awesome for my type of ride. A few of my riding buddies use 28 as single chainring. It really depends on your style of riding. If you are into race, 40/28 will give you more speed. 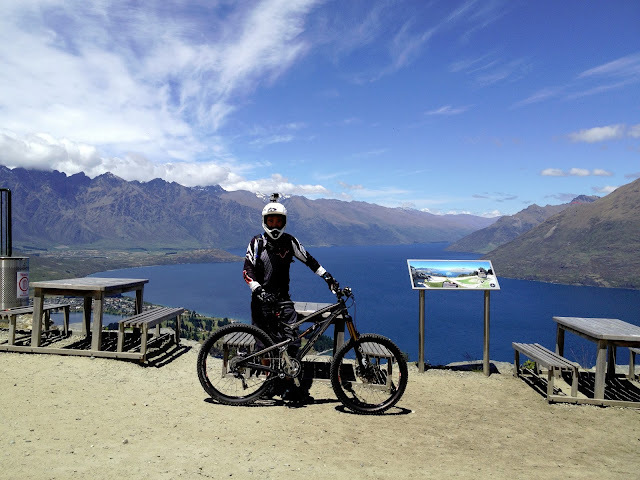 I used to run 1x32t too but quite tough for BT climb and not fast enough on the flat and DH ride. I am now running on 38/26, which I think is good for average rider like me. I have no problem climbing BT and Ketam on 26t. The 38t allows me to gain speed on the flat and down slope as well. I think the gap for 38/24 combo is too wide.